ENGLEWOOD – Don’t do it, John Elway. Don’t waste the No. 10 overall draft pick on a quarterback. 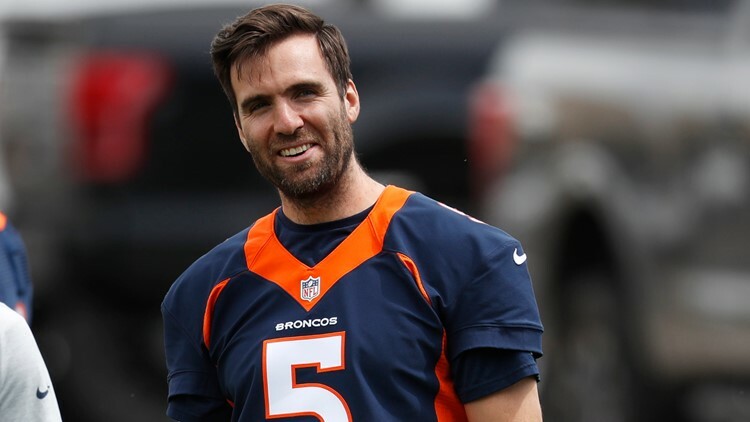 That was the not-so-underlying message new Broncos quarterback Joe Flacco sent to the Broncos’ general manager Tuesday in a press conference following Day 1 of the team’s voluntary minicamp. “I don’t care whether they take a quarterback at 10 or whatnot," Flacco said after his first-ever practice as a Broncos’ starting quarterback. “The only thing I care about is I want this team to be as good as they can with me at quarterback. So if they feel as a team as an organization we can add value to our team with the 10th pick, then I’m all for getting the guy who can add value to the team with me as the understood quarterback." In other words, get a player who can contribute Day 1. An inside linebacker. An offensive guard. A safety. A receiver. A quarterback would stand around with a headset on and listen to plays sent in to Flacco on the field. That quarterback would be fine if he was acquired in, say, the fourth round of the draft. But first round? A waste! A waste Flacco will tell ya. He went through it last year in Baltimore. The Ravens traded back into the first round of the 2018 draft to take athletic quarterback Lamar Jackson with the No. 32 pick. Flacco wasn’t benched for Jackson so much as he injured his right hip in game 9. Jackson came in and the Ravens started winning. When Flacco was healthy enough to play the final month, the Ravens stuck with Jackson. That was then. Flacco is a hired gun for the Broncos now. “I think I had a pretty good outlook on it last year," said Flacco, who supported Jackson despite the rookie’s poor performance through the first three quarters of an opening-round playoff loss last season. “I want to get this team to be the best it is with me at quarterback. “So obviously that’s not of utmost importance to draft a quarterback. But if we do that’s out of my control. I’m going to go out here and compete and he’s going to have to come out here and be on the field with me every day, too. I’m already for that."